My dad liked Ned Miller. I think Mr. Miller only had two hit songs, but my dad was on board with both of them. I read in the New York Times this week that Mr. Miller passed away. I generally only read the New York Times for their political reporting, but one thing the paper does well is recognize those who've left us, people we forgot we even knew. 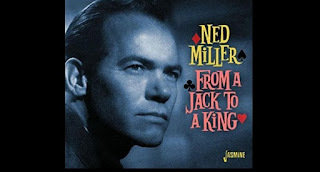 The albeit brief obituary of Ned Miller is interesting, in that it seems the man had such bad stage fright that he rarely performed in front of an audience. Still, his recordings managed to reach the top of the charts. As testament to Mr. Miller's shyness, I can find no performance videos on YouTube. I did, however, find Ricky Van Shelton's version of From A Jack To A King, which introduced the song to a new crop of fans in the nineteen eighties. My dad still preferred the 1962 original. I forgot how much I love that thumping bass and four-four shuffle beat. Ahh, it's a country lover's dream. No wonder Dad loved the song. It's funny how long-term memory works. I'd completely forgotten both of these songs, but I could sing along with both of them and I remembered all the words. Dad taught me well. Nobody younger than me would recognize either of these songs unless they're big Ricky Van Shelton fans, but that's my job here: cataloguing the past. And I kind of owe it to my dad. Rest in peace, Ned Miller. Thanks for making my dad happy.